Lamb Steak SkewersThese moreish lamb steak skewers are perfect for those who shy away from cooking lamb, quick easy and juicy. The grill is a great way to add flavour to any meat or veg, so where better to cook lamb than on the barbie! Don’t be afraid of this succulent meat, it’s easier to cook than most people think. We’ve put together a tasty recipe to get your lamb as juicy and tender as possible whether you like it well done or otherwise! Add the potatoes to a large pot of boiling water boil for 15 minutes until fork tender. Combine the thyme, rosemary, crushed garlic, balsamic vinegar and rapeseed oil in a small bowl and mix well. Pour 3/4 cup of the marinade over the diced lamb steak, cover with cling film and place in the refrigerator for 15 minutes. Once the potatoes are boiled, drain them and place in a small bowl. Pour the remaining marinade over the potatoes, coating evenly. 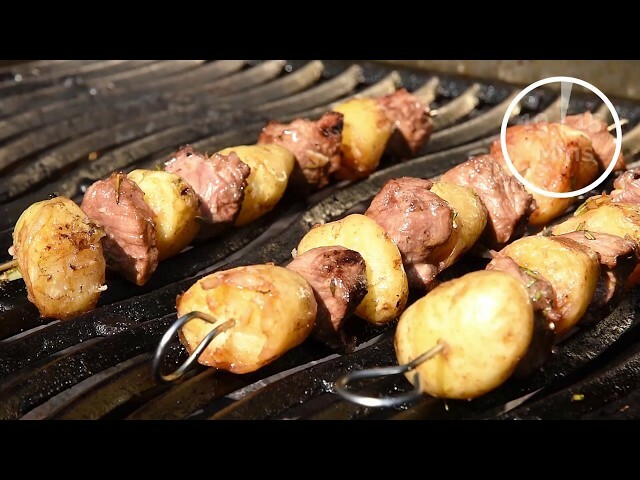 Remove the steak from the refrigerator and skewer potatoes and lamb. Place on a grill over a medium heat for 10-15 minutes, rotating every 2 minutes. Take off the grill when cooked and evenly charred.